When I find products that I really love I like passing them on to you, my three readers. I love you all that much. If you're tired of refilling your dog's water bowl over and over and over again you can keep the pooches well hydrated with fresh, clean, cold water with the Lixit Dog Waterer. This product is so simple that it's brilliant. Attach the Lixit Dog Waterer onto your outdoor faucet or garden hose and when your dog licks or nudges it he'll be rewarded with a cool drink of water (Get it? Lixit? Licks it? Yeah). And it shuts off automatically! No more wasting water when your dog overturns his sun-warmed bowl in disgust or decides to take a swim in his just-refilled dish (ahem, Fisher. The darn dog won't get in my pool but he'll go swimming in his water dish). And the Lixit Dog Waterer is pretty cheap. 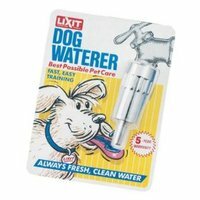 You can get a Lixit Dog Waterer through Amazon.com for $5.99! It will more than pay for itself over the course of one summer. You have 8 readers, Bloglines says so, so nyah. That's a cool product. I'd need to put the dog's run into the side of my house to use it, though, so for now, I'm stuck filling her water bowl every day. brilliant thing to have it in here.Well that is a perfectly a good thing to have it in here, As a matter of fact this is a nice thing to have it in the dog. Simply amazing. I have a pet dog and I a so excited on how to teach him how he could drink with that.